The weather and waves have been pretty calm as we head down the Pascagoula River out to the Gulf of Mexico. 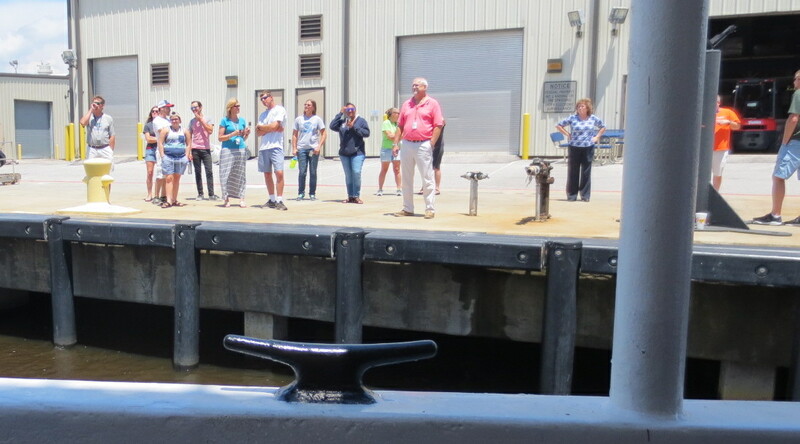 NOAA scientists and staff waved from the dock as we got underway this afternoon! NOAA scientists and staff see us off. While we motored out of port in Pasgacoula, Mississippi, Andre DeBose, the chief scientist met with the science team to give us more details about our mission. We will be visiting the 48 remaining survey stations, all of which are in the eastern Gulf, off the west coast of Florida. The survey protocol is a little different in this area than it was in the western Gulf. Each station will take longer because, before we can begin trawling, we will use several different pieces of equipment to observe the ocean floor to avoid disrupting the sensitive coral reefs which are more widely spread in this area. So, we will not cover as much distance as other legs of the survey have. 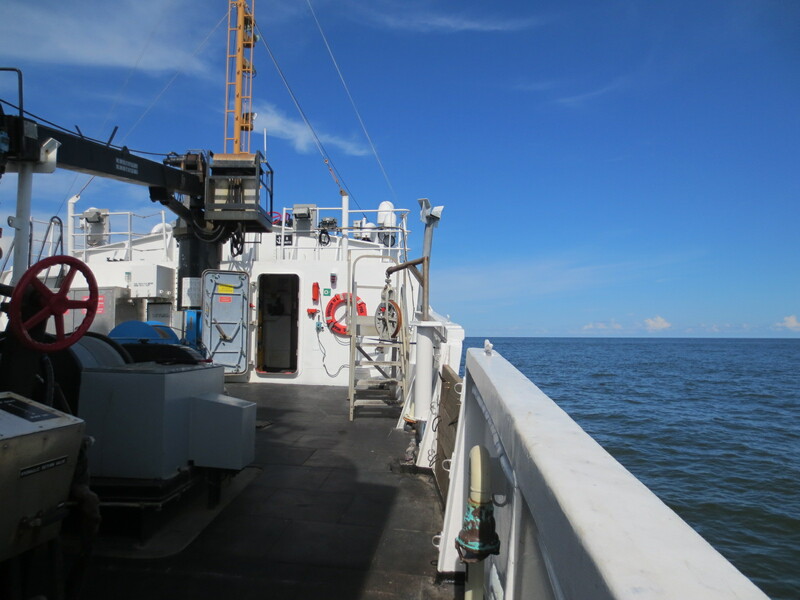 In the meantime, we have 12 hours of “steaming,” or traveling, before we reach our first sampling location. There’s not much for us on the science team to do during this time, so I’ve been trying to get to know others on my team. 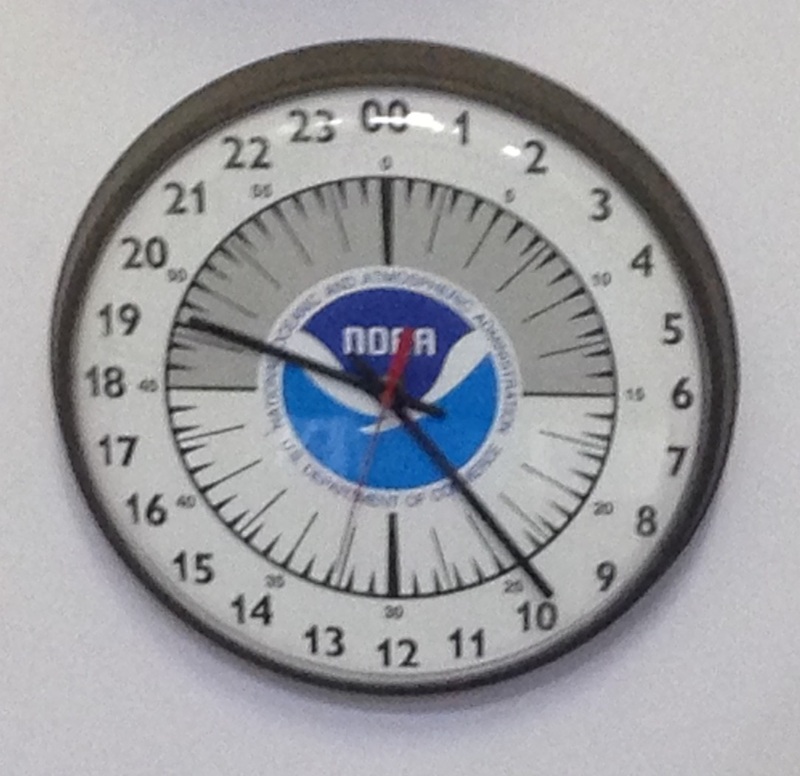 Besides Andre, there are three other senior scientists aboard from NOAA. The rest of the science team is composed of volunteers, most of who are graduate students (including one from Australia and another from Brazil.) Some of them are collecting samples for their own projects and I’m looking forward to learning more about the research that each of them conducts. 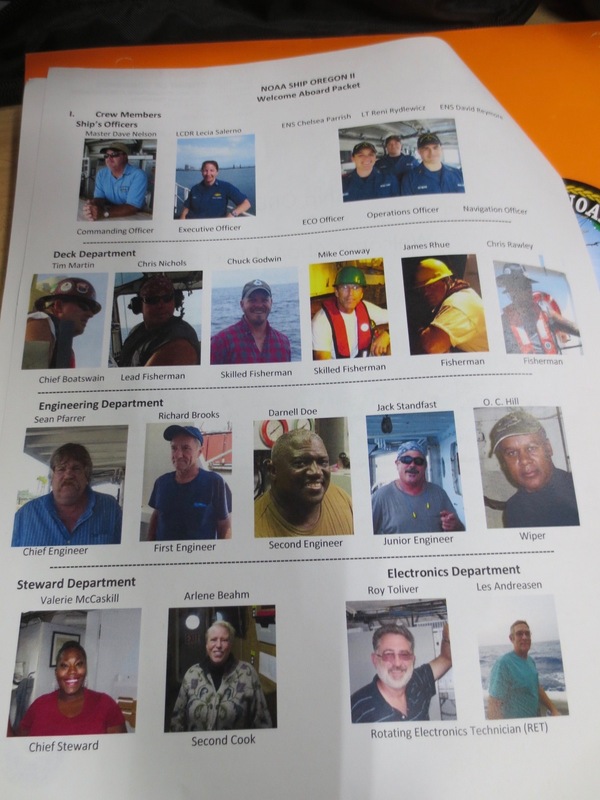 Also on board are 1 Civilian Master and 4 NOAA corps officers who navigate and command the ship, 5 engineers who keep the engines and ship running smoothly, 6 experienced deckhands / fishermen who operate all of the fishing gear and equipment on deck (like the trawl we will be using), 2 stewards who cook all meals and help to make everyone on board comfortable, and 1 electronic technician to make sure scientific equipment and ship electronics are in working order. I’m struck by the way in which all of these individuals, and their diverse skill sets, come together to make this work happen. There were so many details to consider to bring this group together – we each had travel arrangements, medical and security clearances, berthing (rooming) assignments, shift schedules, emergency roles, safety trainings, and more to consider. Each state we will be passing through had to grant permission to work in their waters and all laws restricting fishing and protecting endangered species had to be followed. When I think about what it’s like to be a scientist, I usually imagine a person spending a lot of time thinking about the science involved in project itself, but a huge part of the work of any scientist is logistics – working to bring together all of the right people and materials are in the right place at the right time! I arrived Monday evening and spent last night on the boat. It was nice to have the time to get settled and look around before most of the rest of the crew and science team arrived today. I was told that one or two crew members were aboard, but I did not bump into them, so it felt a little strange to be there mostly alone. I took my motion sickness medicine and then passed the time reading and calling home to talk to my family. My room and bunk are small, so I was a little worried that things might feel claustrophobic, but the time was surprisingly peaceful. It reminded me of being in a tent while camping. The stateroom my roommate and I share. In fact, I’m amazed at how homey the whole ship feels. There are three levels (decks) of inside living space, most of which is berthing (crew rooms, bathrooms, showers, etc.). There is even a set of full size washing and drying machines. The inside space also includes a galley (kitchen/dining area) that seats 12 and a lounge which seats about 8. The lounge is a nice area – it contains a large TV and a binder of about 800 movies (including movies currently in theatres, courtesy of the US Navy!). There is also 1 main level of outside work space, plus a flying bridge (an outdoor area above the bridge) that is the highest deck on the ship. There is exercise equipment scattered in nooks throughout the ship. It’s amazing how efficiently space is used! Everyone is free to move about the ship. The only restrictions are that non-essential persons cannot be on the bridge during busy times or weather and cannot go down to the engine room. However, even with all the freedom, there is always someone sleeping, and most of the outside areas are jam-packed with scientific and fishing equipment, and it is very easy to unintentionally disturb or get in the way of others. We all have to be constantly aware to keep ourselves safe and be considerate of the people around us. Fortunately, everybody I’ve met is so friendly and thoughtful – there’s definitely a feeling that we’re all on the same team. The science team and some crew on the ship work either the day shift (from noon until midnight) or the night shift (from midnight to noon). I lucked out to be on day shift, so I won’t need to alter my sleeping schedule drastically. The ship operates on military time. bit difficult to know what to do with oneself during down time, especially since your roommate is typically sleeping while you’re awake. I’m finding that I really enjoy standing outside, along the side of the ship and looking out at the open water, or holing up in a corner of the lounge with my computer or book. Once I start my first shift, I’m sure I’ll be glad to have the time just to rest. There aren’t too many opportunities for socializing as everyone is either working or sleeping most of the time, but everyone seems to laugh and joke around when they are able. Tomorrow, I’ll start my first shift and should see some fish! The freshwater used aboard for drinking, showering, etc. is drawn directly from the ocean. The saltwater is filtered with equipment using a process called reverse osmosis, where high pressure separates particles resulting in freshwater. Several of the fishing crew and officers are also trained MPIC’s (medical person in charge). They are medically trained to respond and provide emergency care. In the event of a more serious illness or injury, they are able to contact doctors on land and implement their instructions. All sewage on board is broken down by bacteria. Once processed through a marine sanitation device (MSD), this treated water is safer for the environment. Following the appropriate maritime regulations, it can then be released into the ocean. Reflect: Scientific fieldwork, even work on land, often requires travel and adapting to unusual circumstances. How would you handle living and working in unusual, sometimes extreme, conditions? This entry was posted in 2017, Anna Levy, NOAA Teacher at Sea and tagged groundfish survey, Oregon II. Bookmark the permalink.